Love is in the air - get a jump start on your valentines' gifts with this hand building class. 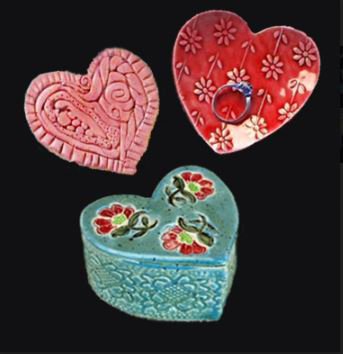 Choose to make a heart shaped box, dish, or trivet, or all three if you are ambitious. We'll learn some texture techniques and underglazing basics along with slab building and coiling. Personalize it with stamped letters if you like. This class is in the Clay Studio on Fri., Jan. 25, from 6:30-9pm. Instructor Karen Flynn will either clear glaze your work if you use colorful underglazes, or you can pick from our glazes and she will glaze them with their chosen glaze after the bisque fire. This class would make an excellent Holiday gift! Open to children 10 and older as well as adults. Children between 10-16 should have an adult also registered for the class. People are welcome to bring wine or other beverages if they wish. Price is $28 plus $8 supplies and $4/piece for firing.